Recognizing the widening gaps in the postsecondary attainment of American Indians and Alaska Natives (AI/AN) compared to majority students, the Western Interstate Commission for Higher Education (WICHE) has launched Reducing the Postsecondary Attainment Gap for American Indians and Alaska Natives: Linking Policy and Practice. With a three-year grant from Lumina Foundation, the project is a new collaboration of two-year and four-year institutions that have been designated as Native American Serving Non-Tribal Institutions by the U.S. Department of Education. The initiative will cultivate a network of institutions serving large numbers of American Indian/Alaska Native (AI/AN) students to define common goals, metrics, and strategies to improve the retention, graduation, and credential attainment of Native students. During the first year of program activities, Native-Serving Institutions have launched programs and set quantifiable goals to narrow attainment gaps, holding their institutions accountable while sharing evidence-based, high-impact practices leading to AI/AN student empowerment and success. WICHE, with its 16 member states and the U.S. Pacific Territories and Freely Associated States, has promoted access, opportunity, and innovation in the Western region and nationally for more than 60 years. Because the Commission is comprised of leaders in higher education, policy makers appointed by state governors, and state higher education executive officers, WICHE maintains a strong voice in higher education policy in the West and nationally. As a retired senior administrator at a Native American Serving Non-Tribal Institution, my work at WICHE continues a career long commitment to providing educational opportunities for American Indians and Alaska Natives. While the percentage of AI/AN achieving an associate’s degree or higher increased slightly from 23.4 percent in 2012 to 23.9 percent in 2015, the achievement gap between AI/AN and Whites has grown, with Whites increasing from 43.9 percent to 45.7 percent during the same time period. Likewise, six-year graduation rates of AI/AN students continue to lag far behind other groups, as reported in February 2017 by the National Center for Education Statistics (NCES), with an average six- year graduation rate of 33.5 percent for AI/AN in public four-year institutions compared to a six- year rate of 58.7 percent for Whites, 48.7 percent for Hispanic/Latinos, and 36.7 percent for Black/African Americans. Data from public two-year institutions is even more dismal, with only 17.7 percent of AI/AN students graduating within 150 percent of the normal time compared to 27.1 percent of Whites. This means that two out of three AI/AN students enrolled in baccalaureate programs are in serious danger of not completing their degree and only one in five enrolled in two- year institutions will complete their program. 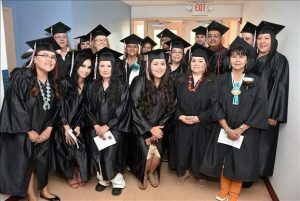 Colleges and universities participating in the program have woven Native culture into evidence-based strategies and practices that are linked to supportive higher education policies at the state and federal levels, and unique to Native-serving institutions, at the level of tribal governance. An inclusive curriculum and student support activities that reinforce pride in the cultural heritage of Native students and promote a sense of connection and belonging are important to academic success. The project shows promise to contribute to our understanding of effective practices for improving Native student attainment, and also represents a unique opportunity to invite Native Serving Institutions to become communities of common policy and practice, building networks of shared purpose, and the capacity for a collective impact on the problem of AI/AN college completion. 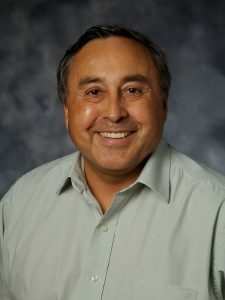 A member of the Blackfeet Tribe, Ken Pepion, Ph.D., is senior project director at the Western Interstate Commission for Higher Education in Boulder, CO. For more information on WICHE programs, visit https://www.wiche.edu/ or follow them on Twitter @wicheEDU.